On 23 October 1918 Katherine Wade Dalton married her fiancé at St.Mary’s church in the Lace Market area of Nottingham. Just one week later the newly-wed returned to St.Mary’s for her funeral – just one of 60,000 deaths from ‘Spanish Flu’ said to have occurred in Nottingham during October and November of that year. This is just one of the sobering local facts recorded by Nottingham author Catharine Arnold in her recently published book Pandemic 1918: The story of the Deadliest Influenza in History (London: Michael O'Mara, 2018). 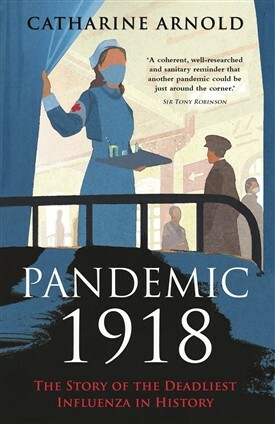 Across Europe the flu pandemic of 1918-19 is said to have been responsible for more deaths than all those killed in the Great War. It was a particularly virulent kind of flu which caused bleeding and septicaemia of the lungs for which, at the time, there was no known cure. As the First World War drew to a close the ‘flu spread right across Europe, decimated both sides in the conflict, crossed the Atlantic to the USA, and (introduced to civilian populations via naval ports and returning soldiers), affected every part of the UK. At one point during the first wave of infection 250 miners at Mansfield Colliery succumbed in one day. In June and July 1918 a total of 10,000 influenza deaths had been recorded in Great Britain. By November 1918 this figure exceeded 70,000 (75). 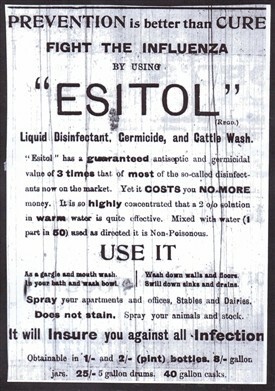 Although Influenza was not a notifiable disease (meaning that it was not obligatory for every case to be reported) the Medical Officer for Newark-on-Trent in Nottinghamshire nevertheless recorded 44 deaths in the Borough in his annual report of 1918/19, influenza being the single biggest killer that year. Measures to curb the outbreak, said S. Nicol Galbraith, Medical Officer of Health for Newark, included systematic gargling with antiseptic for all school children in the town. 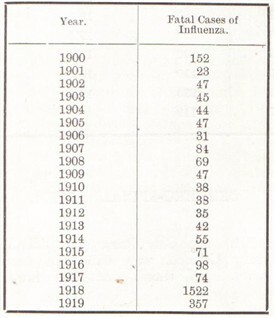 Across the county, meanwhile, the county Medical Officer's annual report for 1920 (pictured) included a table showing that countywide in 1918 there were 1522 deaths from influenza, as compared with 74 and 98 in the previous two years. 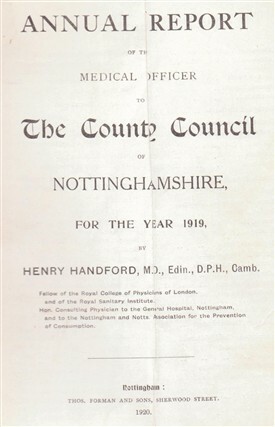 "The cases in 1919", the report continued, "occurred mainly in the spring epidemic of February and March when the county medical officer [Henry Handford] was himself a victim, and for several weeks unable to continue any personal part in directing preventive measures"
This page was added by Website Administrator on 29/10/2018.